Our sailboat expert names 10 top sailboats introduced during the past year—and explains why they make her list. It was difficult to choose 10 top picks from the many new sailboats introduced in 2013, but from those we visited, tested, and ogled, here are the ones that made an impression—and made our own wish list (ordered by size). 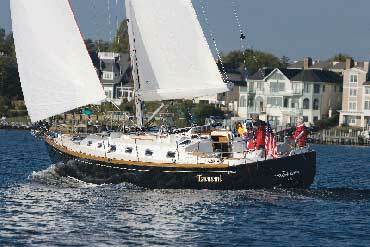 Tartan’s new Fantail Series offers three models of a 26-foot rocket with classic lines by designer Tim Jackett. The Daysailer (DS), Weekender (WE) and Self-Trainer (ST) differ slightly but all are perfect for the singlehander or racing couple. With a nearly plumb bow, fine entry, reverse transom and slight sheer, the Fantail evokes another era above the waterline. 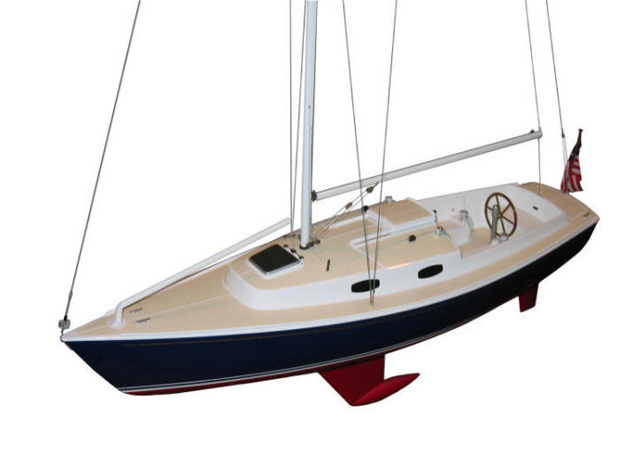 This is balanced with a modern underbody featuring a high-aspect rudder and a deep keel with a 1200-pound bulb. Like other Tartans, the Fantail has a large fractional rig, a pocket boom with an integral mainsail cover and lazyjacks. A carbon fibre retractable sprit holds the furler for the asymmetrical spinnaker. The cockpit is large and built to be sat in rather than on. It’s nine feet long, which provides plenty of room for crew even with a tiller. An opening well under the small aft deck holds a Torqueedo Cruise 2.0 electric outboard with remote controls in the cockpit. 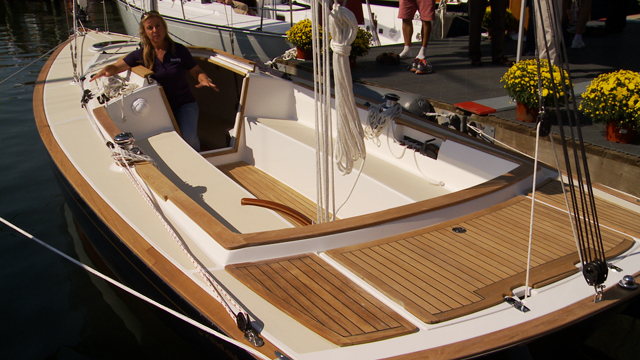 The DS has quite a bit of teak trim topsides for aesthetics. It also has sitting headroom below and offers a portable marine head, a 40-quart cooler, a stereo, and plenty of varnished trim. The WE version has additional headroom, an alcohol stove and sink, and a real marine head with a holding tank. 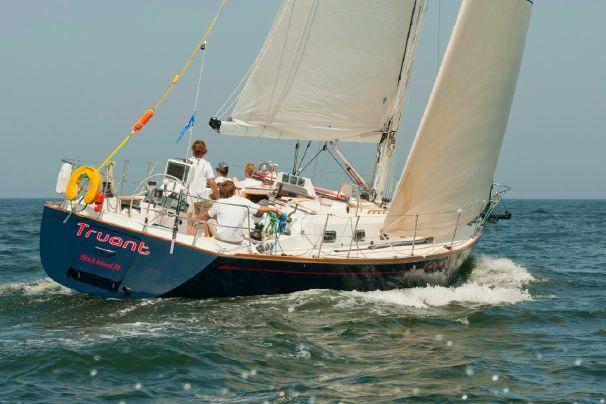 For more information read our full review, Tartan Fantail 26: Three flavours Triple the Sailing Fun, or visit Tartan. The Harbor 30, dubbed a “Daysailer Plus”, was brought from paper to reality by W.D. Schock former president, Tom Schock, and his designer brother, Steven. Designed to perform on the race course, this good-looking boat also fits most ways people will want to use it—whether for an afternoon cocktail cruise or an extended weekend. 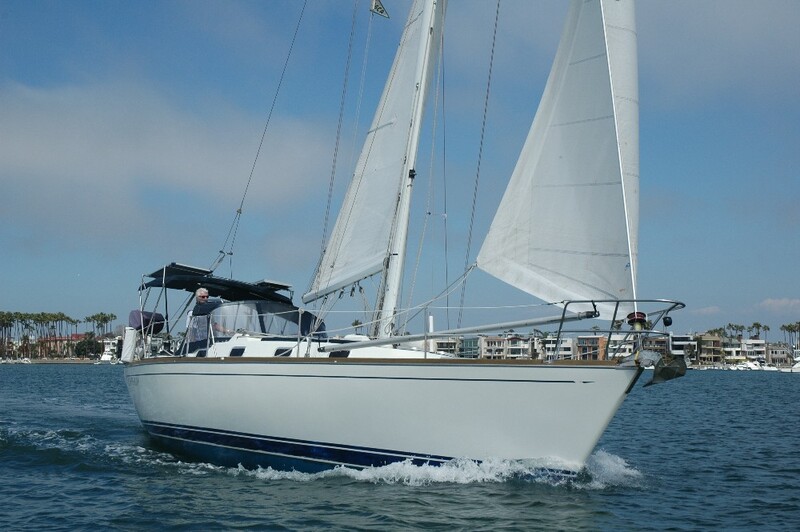 The Harbor 30 has a deck-stepped mast with double aft swept spreaders and a 7/8 fractional rig with a self-tacking jib. The standard deep keel draws 6’3” but a shoal draft is available at 4’5”. Her fine entry and long narrow keel give her great pointing ability and the turn of the bilge aft is firm for good form stability. The cockpit is 7’9” long and clear of clutter all the way back to the wheel where a pedestal holds a chartplotter and an optional swing-up table. The small aft deck behind the wheel provides access to a giant lazarette and the transom drops down to form a swim step for easy boarding from a dock or the water. Below, the Harbor 30 is cozy and inviting. To starboard is a compact galley with a circular sink, an insulated ice box, a faux-granite counter and the choice of a two-burner stove or a microwave. To port is an enclosed head and a wet locker. Two settees with an optional table create a nice dinette. With white beaded board, varnished mahogany trim, blue-striped upholstery and a teak and holly sole, the effect is classic. 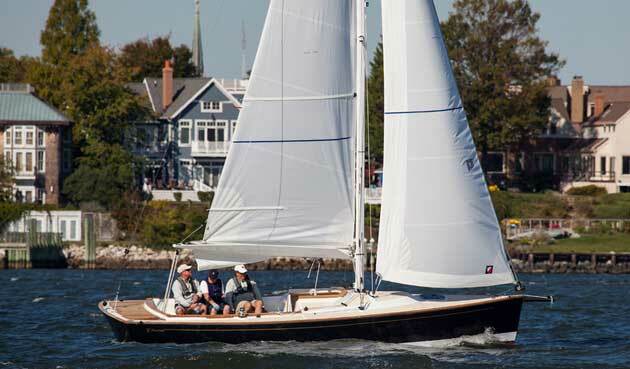 For more information, read our full review Schock Harbor 30: Single Handed Sailing, or visit W. D. Schock. Catalina has dubbed their latest line of performance cruisers the 5 Series and has set about branding this new group much like BMW markets their various models. The US-designed and built line now includes a new baby, the 315, which is a near-perfect pocket cruiser for a couple. The emphasis in the 5 Series is on strength, with a five-part construction process wherein the hull, internal grid structure, hull liner, deck liner, and deck are all molded separately. A watertight collision bulkhead is forward and the fractional rig is deck-stepped with a compression post support system that’s metal-to-metal and doesn’t sandwich the deck, therefore relieving it of compression and the resulting potential for sagging or gelcoat cracks. 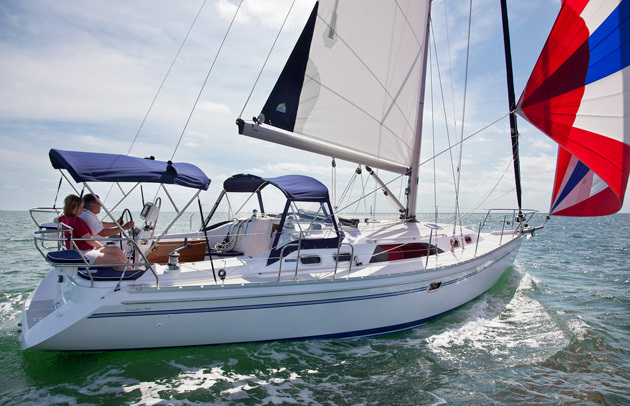 On deck, the low profile cabintop is sleeker and has less windage than previous models, and Catalina’s trademark large, ergonomically correct cockpit makes the 315 comfortable under way or at anchor. Catalina’s philosophy embraces “designing boats that stand up to real-world conditions, sail well, are comfortable above and below, are easy to maintain, and hold their value.” The response from the boat-buying public has shown that the 315 certainly lives up to that. For more information, visit Catalina. Many production boat manufacturers have played with the term racer/cruiser and the resulting boats have often been criticized for being neither. Dufour’s 36 Performance may just be both. Fast, responsive, and easy-to-sail, the new design is convertible and will definitely walk the fine line between summertime beer can races and long weekends cruising in comfort. The 7/8 fractional rig has a keel-stepped Sparcraft mast and aft-swept spreaders. 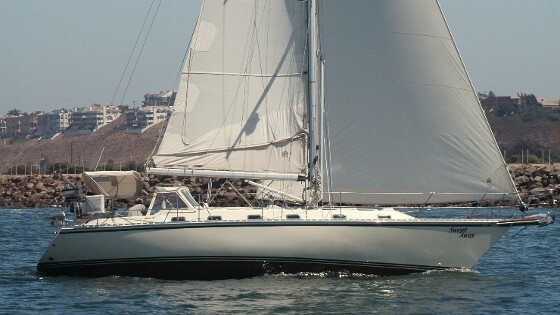 The standard configuration includes a traditional main and a 100-115% jib, although a track for a larger genoa is added. The twin helm wheels are pushed outward so there’s room to work when racing, or to walk through to the transom when cruising. The 36P represents a new direction for Dufour. The French company already has their Grand Large cruiser line and going forward, this new 36-foot model may be overtaking their E-series performance designs. Whether the 36P is ever raced or not, she will provide her owner with hours of fun—and great weekend getaways as well. For more information, read our full review Dufour Yachts 36P: Is it a Racing Sailboat, or is it a Cruiser? Yes, or visit Dufour Yachts. When German engineering meets effortless sailing, the result is crazy fun. 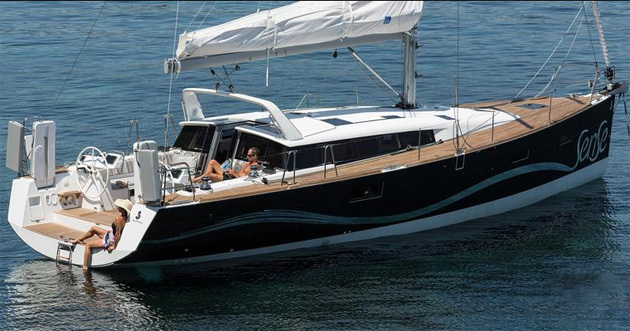 Like the rest of Hanse’s 5 series line, the Hanse 415, with her plumb bow and low cabintop, looks serious and fast. 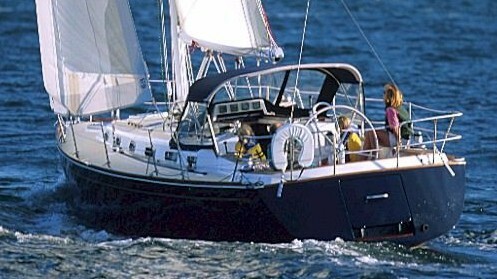 The waterline was extended two feet over her predecessor, the popular Hanse 400. Since the sail plan was kept the same, the 415 may be a tiny bit faster. She’s also a foot wider which provides more room in the interior, perhaps a 10 percent increase. The complete lack of drama in sail management and tacking will make her well-behaved on a windy day, even when singlehanded. The standard layout has two cabins and one head and provides good value as it’s the cheapest version; in my view, it's also the best version for a cruising couple. There are now eight models in the very successful 5 series line ranging from 32 to 57 feet. Hanse is providing high volumes for their state-of-the art production facility in Griefswald, Germany, so it’s not only able to keep the prices sane, it’s poised to make real inroads into the U.S. market. 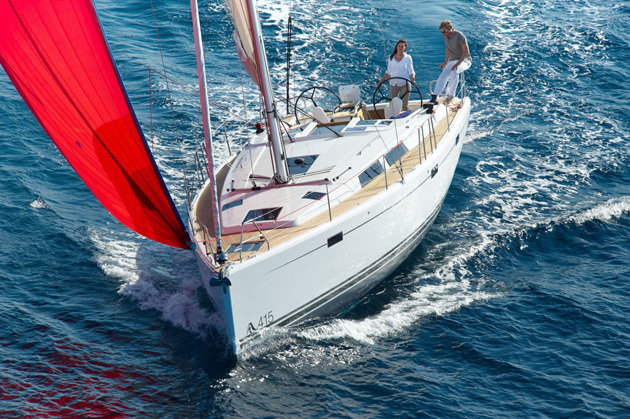 For more information, read our full review Hanse 415: German Precision Meets Effortless Sailing, or visit Hanse. 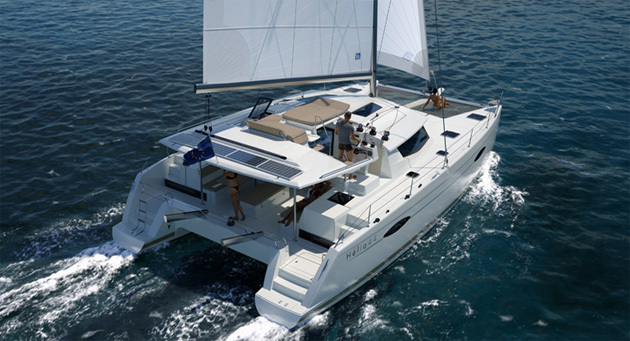 French catamaran builder Fountaine Pajot introduced the Helia 44, the 19th design in its 30-year history. The 44-foot bluewater sailing catamaran combines good looks with practical livability, and replaces the Orana 44 model with one that’s notable in how well it incorporates the best features of other Fountaine Pajot models. 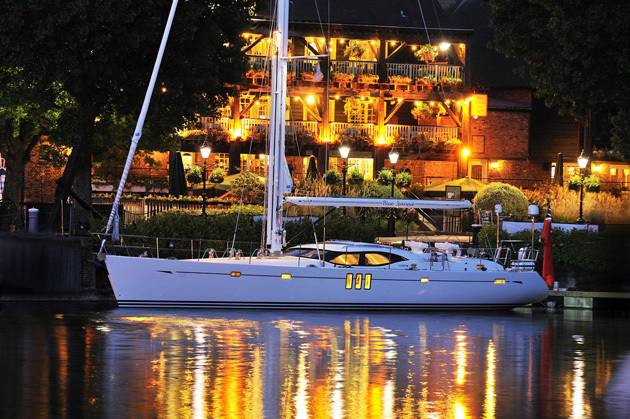 The Helia is offered with four cabins and four heads or three cabins and three heads, with the entire starboard hull dedicated to the owner’s retreat. The cockpit is on the same level as the saloon, which brings the interior together with the exterior in a nice, easy flow. The U-shaped galley to port has everything within reach, including two-drawer refrigeration at the entryway and a sliding window to easily pass food and drinks through. Indirect lighting in the cabin-top and under the counters creates a nice ambience in the contemporary interior. The cockpit, which is entirely covered by the hardtop, divides into a large port-side dinette that will seat eight, and a lounge to starboard. Steps lead up to the flybridge with a triple helm seat, 360 degree visibility, and everything within reach for single-handing. Fountaine Pajot designs multihull trawlers as well, and they’ve brought the flybridge concept over to the sail side by incorporating a seating lounge and a double sunpad in an area that’s sure to become the social spot for sunset cocktail hour. For more information, read our full review Helia 44: A New Design from Fountaine Pajot, or visit Fountaine Pajot. Catamarans are the fastest growing segment of production charter boats, but trimarans have mostly haunted the offshore racing circuit—few designs have successfully crossed over to being comfortable cruising platforms that still deliver double digit speed. Enter NEEL, which builds 45, 50 and 60-foot models in their plant in La Rochelle, France. The smallest of the designs has the profile of a catamaran and with its vertical saloon windows, resembles the early style of Lagoons. 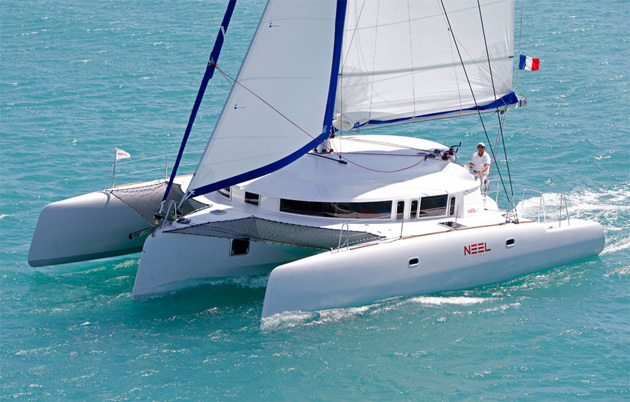 But unlike a production catamaran, the NEEL 45 is built to fly a hull (which is actually an ama) and to consistently deliver 10 knots of speed under sail. The cockpit of the NEEL 45 is split with a table and settee on either side. A lounge is elevated on the starboard side and the raised helm is to port. Twin headsails and a mainsail with significant roach drive the boat, and electric winches are optional. Unlike a cat, this trimaran will sail well upwind, tacking within 90 degrees, and will pound less into head seas thanks to the third hull. Auxiliary power is provided by a 55 hp Volvo with a Saildrive and although not as maneuverable as a cat with twin engines, the NEEL 45 handles well under power. For more information, read our full review NEEL 45:Creature Comfort Meets High Performance Trimaran Sailing, or visit NEEL Trimarans. The fourth in the Sense line, the 46 shares many features with her sisters including catamaran crossover benefits for those who love cats but can’t quite commit. Some have dubbed the Sense line “monomarans” for their enormous, catamaran-like cockpits. Life aboard the Sense 46 includes three somewhat separate areas that still flow seamlessly together. In the easy outdoor living of the cockpit, the helm seats lift sideways to open up the entire transom for easy boarding. Twin wheels provide good visibility forward, and winches are within reach for stress-free singlehanded sailing. The mainsheet is up and out of the way on an arch that also serves as a great attachment point for a dodger. As on other Sense models, the space below the cockpit sole is reserved for noisy machinery (like pumps and an optional genset,) and the sole lifts up to reveal excellent access to the systems below. 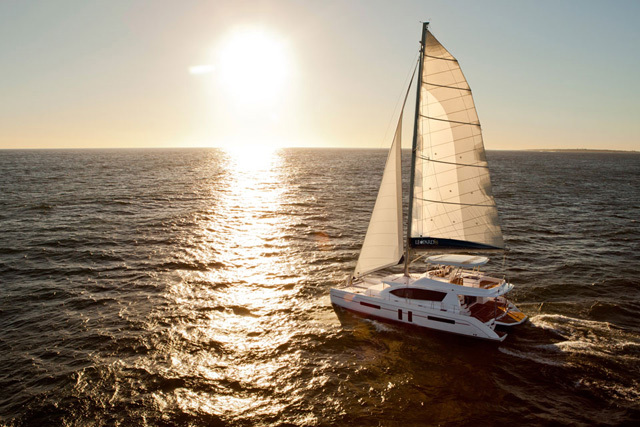 If you’re thinking of moving from a monohull to a catamaran but can’t quite make the switch, the Sense 46 gives you the stability and roominess of a cat while still sailing only one hull. For more information read our full review Beneteau Sense 46: Multihull Appeal, Monohull Benefits, or visit Beneteau. Standing on the dock, you get a sense of what a big kitty the Leopard 58 really is. Once aboard, it’s clear this experience is not just about size, but also about luxury. The flybridge seats up to 12 and has standing room for twice that many. A U-shaped settee is to starboard and protected by the hardtop Bimini. A wet bar, refrigerator, BBQ and sunning loungers are out on the aft deck. The 58 has only one helm station and it’s up here with full engine controls, multiple electronics displays, and three winches which miraculously control all the lines on this 73,000 pound behemoth carrying over 2,000 square feet of sail area. One thing the 58 borrowed from its award-wining little sister, the Leopard 44, is the concept of the forward cockpit. This smaller, covered cockpit is accessible from the two forward staterooms or from the forward deck and trampoline. Formal dining is likely to happen in the aft cockpit, which is on the bridge deck as a continuation of the indoor/outdoor flow, through the interior and out to the forward cockpit. Combine these three completely separate outdoor areas with the numerous interior cabins, and everyone can easily find their own space when privacy is the order of the day. For more information, visit Leopard Catamarans. The Oyster 625 exudes the luxury of the brand and will undoubtedly feature in ocean-going fantasies that start with “if I won the lottery…” Oyster’s latest introduction is the 625, which replaces the 62. With this model, designer Rob Humphreys stepped up Oyster’s performance by creating a flatter underbody than her predecessor and significantly reducing displacement. The result has been ease of handling and increased speed. On deck, the 625 is sleek, with stanchions and cleats out on the low bulwarks and clear decks all around. The triple-spreader rig carries nearly 2,000 square feet of sail area and comes with rig configuration options including an inner forestay and in-mast furling on the mainsail. There are dual cockpits with the forward one being more of a social area, where those not involved in the yacht’s handling can relax and converse. Twin helms anchor the aft cockpit with some of the winches positioned behind the helmsman. An interesting option is three vertical hull windows, which bring terrific light into the salon and add a superyacht feel. 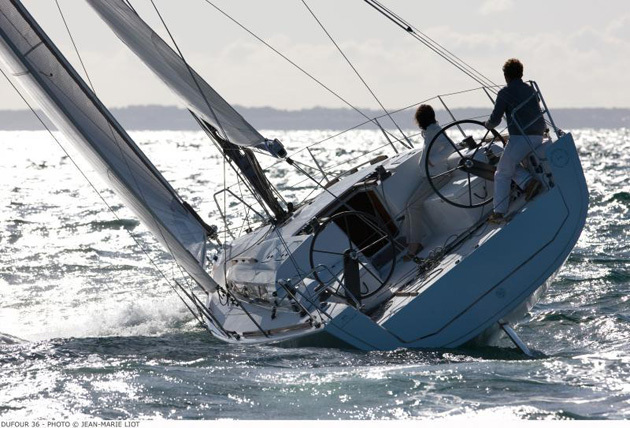 For more information read our review Oyster 625: Pedigree Under Sail, Or visit Oyster.